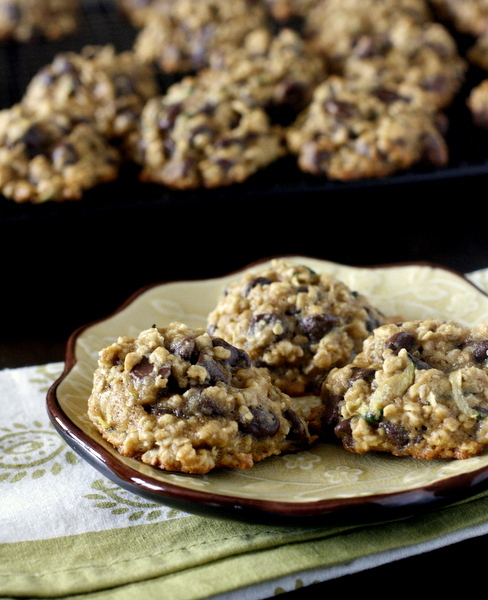 Zucchini Oatmeal Chocolate Chip Cookies – that’s a mouthful, isn’t it? I almost added the words “whole wheat” into the name of these as well, but it seemed like a bit much. 🙂 No matter what you call them, you will want to make these cookies. They are so good! I love trying new zucchini recipes, and since we don’t have a garden this year I had to beg an extra zucchini from a friend just to try this recipe. 🙂 This is a one-bowl recipe and only takes about 5 minutes to throw together. 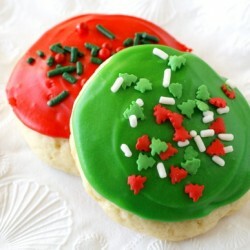 The cookies are absolutely delicious warm, but still tasted great after 3-4 days on the counter. Looking back, I can’t believe they lasted that long because they are slightly addiciting. They are soft and just a little bit cakey, but they also have a great chewy texture from the oats. The chocolate chips give you chocolate in every bite, and really, what more can you ask for from a cookie? 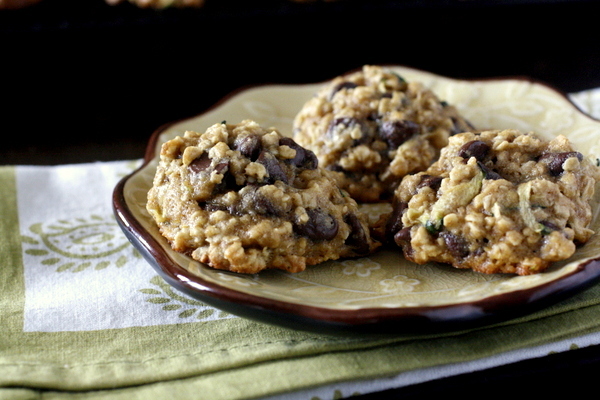 These zucchini oatmeal chocolate chip cookies are definitely a new favorite! Preheat your oven to 350°F. Lightly grease two baking sheets; or line them with parchment. In a large bowl whisk together the oil, sugar, baking powder, baking soda, salt, vanilla, and egg until well combined. Stir in the zucchini and chocolate chips, then the flour and oats. Let the batter rest for 15 minutes to give the oats a chance to absorb some of the liquid. Drop the dough by tablespoonfuls onto the prepared baking sheets, leaving about 1 1/2" between them. Bake the cookies for 14 to 16 minutes, or until they feel set on top and the bottoms are beginning to brown. 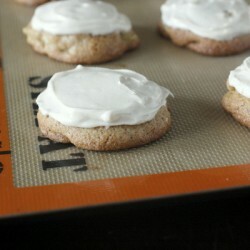 Remove the cookies from the oven, and let them cool on the baking sheets. Place cooled cookies in a covered container at room temperature. Store at room temperature for several days; freeze for longer storage. Oh no!! I wish I had gotten this earlier. I had some zucchini grated I needed to use. 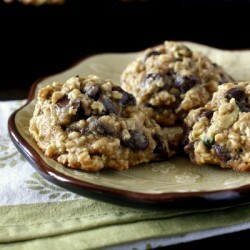 I found a zucchini carrot oatmeal cookie recipe. 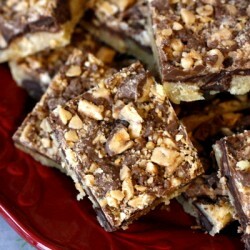 I made them and have them in the freezer getting set to put in a ziplock bag to bake when I want them. I love having cookie dough balls made in the freezer. Your recipe looks good. 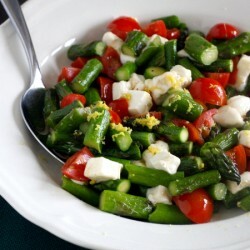 Dinner in the oven and came across this recipe. I have all the ingredients too. Needed a dessert for a baby meal tomorrow! Can’t wait to taste them! Thank you! Just made these and they are really good. I used a tablespoon-size cookie scoop and it made more than 32 cookies, which was great! I made these tonight with mini chocolate chips and old-fashioned oats because that’s what I had in my fridge, and they turned out beautifully! Took them to book club and they were a big hit!